There was a lot of wet wind outside this morning, strong sideways drizzle; the dog and I were soaked through after our walk. She’s now curled up in a tight ball in her chair (I know) next to the radiator and I’m on my second mug of coffee. It’s the spring equinox today but it certainly doesn’t feel like the first day of spring! The advice is to prune off two-thirds once planted to encourage bushy, healthy growth but our plants are so short that I reduced them by one-third to a half, and cut back any side shoots quite hard. Rather than compost all the cuttings, I rescued the longest few and brought them inside. Since they’ve been in the warmth indoors, they’ve all started to come into leaf and even flower. I’m fairly sure that the white flowers are Amelanchier and one of the stems is Acer, but I’m not sure about the rest. Whatever they are, I’m delighted they’re doing their thing and I think they look lovely next to the little vitreous enamel panel by artist Janine Partington (a much-loved gift from my brother and sister-in-law). I also photographed this burst of sunshine in a vase – cheap supermarket daffodils – which are cheering up the lounge on this dull day. Big thanks to Cathy at Rambling in the Garden for hosting the weekly gathering of Monday vases – I do so love joining in. She is celebrating five years(!) 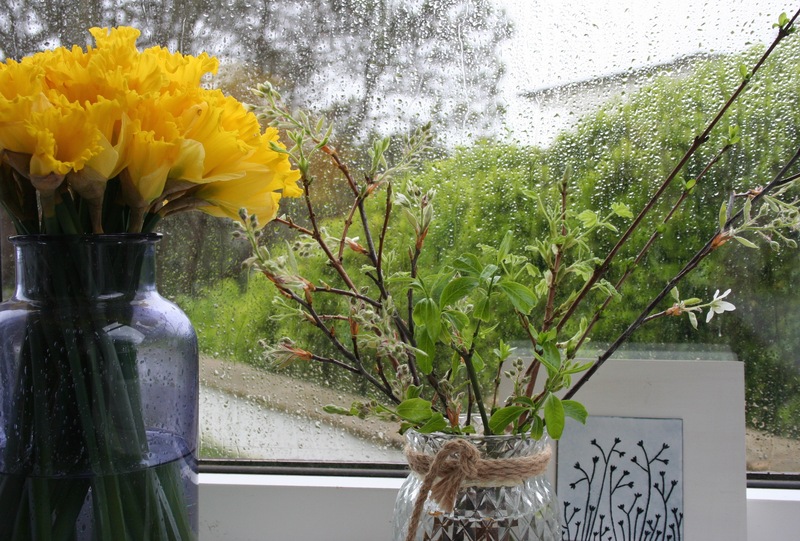 of blogging this week with a pretty vase, made by her daughter, full of pink spring blooms. I hope you won’t mind me sharing a bit of thrilling Agnes news here: Olympic hockey superstar Crista Cullen has kindly answered a load of questions about her teenage years to launch our new blog feature. Do take a look if you have a moment. Thank you. My cat and your dog employ the same strategies in response to cold (although I suspect your version of cold and mine aren’t much alike). The forced flower stems are beautiful. Forcing blooms isn’t something I’ve ever tried but I may do so if I can find an appropriate subject – the appearance of blooms from what appears to be a dead stick strikes me as a very appropriate minor miracle to recognize spring! It is a minor miracle, isn’t it?! Thanks, CJ. An old neighbour of ours used to net his cherry tree but I worried about birds getting caught in it. I guess you just have to try and beat them to some of the fruit! Hmm, yes, the blackthorn is very spiny. Oh well… Re Agnes, we’re ploughing on and hoping it reaches as many teenage girls as possible. The hedge cuttings seem so graceful and hopefully the hedge will follow suit. I love a tapestry hedge. 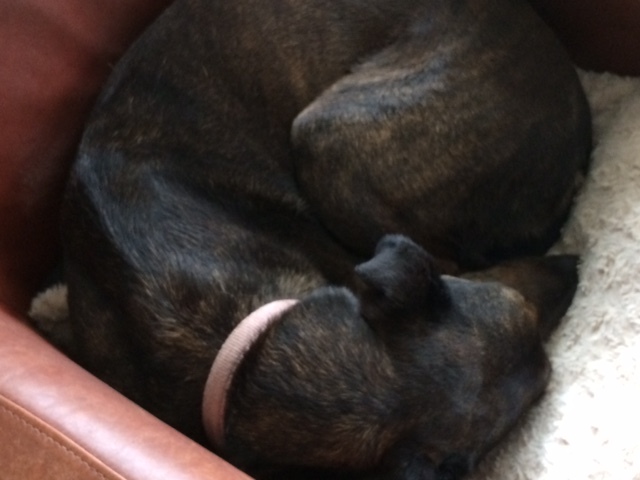 I spent an afternoon repairing dog beds last week – the dogs may be more comfortable than we are! Gosh, that really is a mixed hedge – what great species they are and what a good idea to use the prunings for your vase. 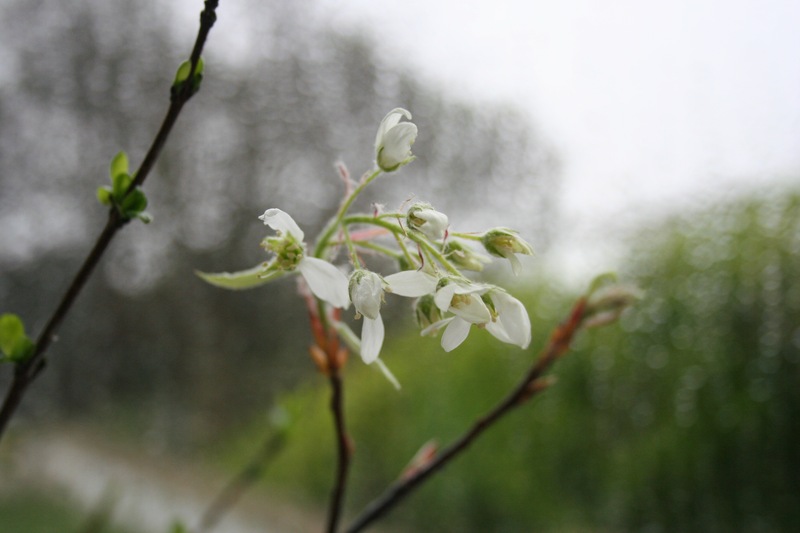 I am pretty sure my amelanchier’s leaves appear before the blooms, a very pretty coppery colour when they are young, so I suspect your white flowers must be one of the others, possibly the bird cherry? I am so pleased that you are getting some high profile interest in Agnes – and do you have stats on how many people have visited the site? We do have stats – some days there are lots, other days not so many. It’s hard to get noticed among all the noise but we will persevere! The blossom went over after a few days but the leaves are still looking good. I’ll take a pic. 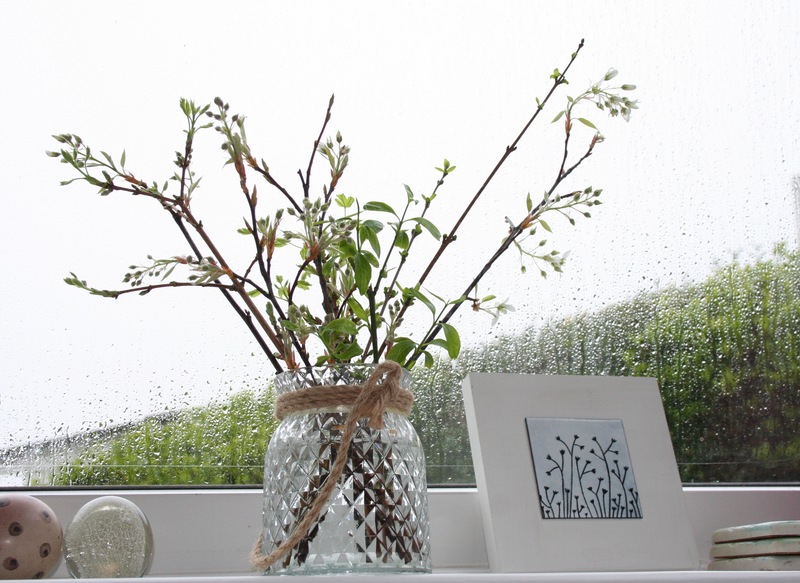 New leaf buds are a refreshing sight, nice to see them being made good use of in a vase. Maybe the cuttings will root? Good news about Agnes, too. Thanks, Kate. Yes, I was wondering whether they’ll send out roots. 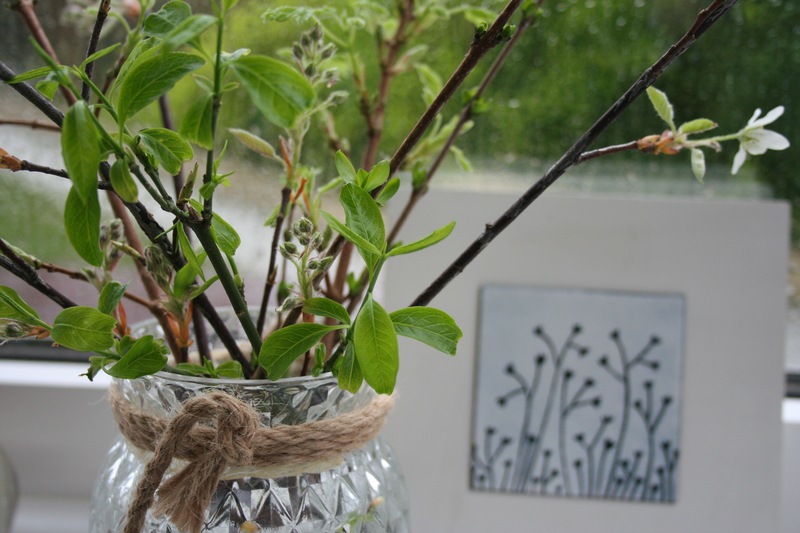 A lovely idea to put your hedge cuttings in a vase. I have a large bowl of amelanchier opening up inside right now as I lost a huge part of the tree in storm Doris. This constant wind is spoiling the garden and makes me feel like curling up by the radiator too. I know what you mean about the wind. It’s not nice to be outside. 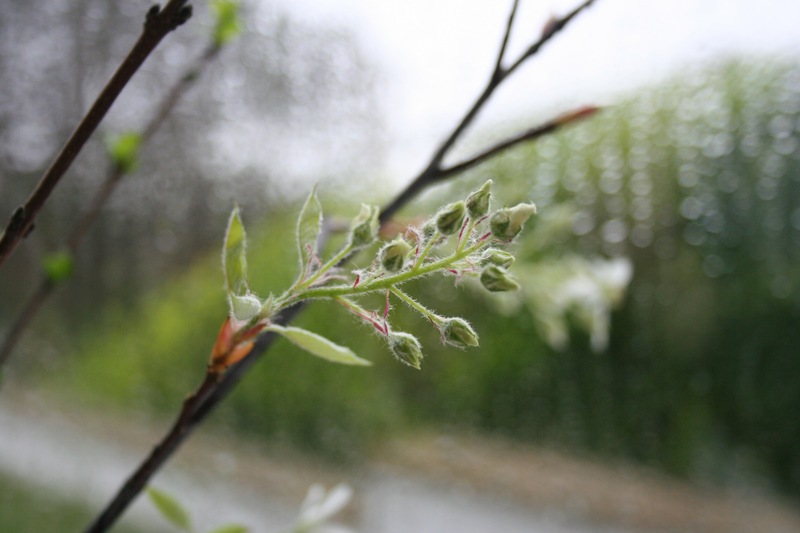 Sorry about your amelanchier – they’re lovely trees. We are working on building a boundary at the front of our house and hoping to incorporate native plants so this has been very timely inspiration for me. We planted cobnuts last week. How tall to you expect to grow the hawthorn and blackthorn? I expect your hedge will be wonderful given some time and, in the mean time, your vase is a delight. Also, I adore that little panel! We’re going to keep the hedge a manageable size so we can still see the sea, so they won’t grow as large as they would if left be. I hope you get a harvest from your cobnuts. Just back from a visit to Agnes: what a brilliant and inspiring opening to the blog. Congratulations! It’s more spring-like here today, Jane. Hope it’s more autumnal with you. What an excellent idea for your hedge, although rather prickly. Kudos on Agnes! I just found your blog and I absolutely adore it, so lovely and heart warming! I look forward to following! Ha ha, Ted and Pops would probably get chairs if they lived here. We were probably too soft on Cassie when she came to live with us (because of her hard start in life) and now she’s a bit of a princess! There is nothing wrong with a pet having their own chair. We currently have a cat with her own room… mainly because she is a tetchy rescue cat who needs to be introduced slowly to our resident lady of 15 who is very territorial. I am very envious of your coastal location but love the Monday vase idea and look forward to future vases. Hope the new hedge grows well, it is a lovely mixture. Gosh, her own room! Hope your cats get on well eventually. Good luck with your hedge … it sounds packed with interest and fruitfulness! 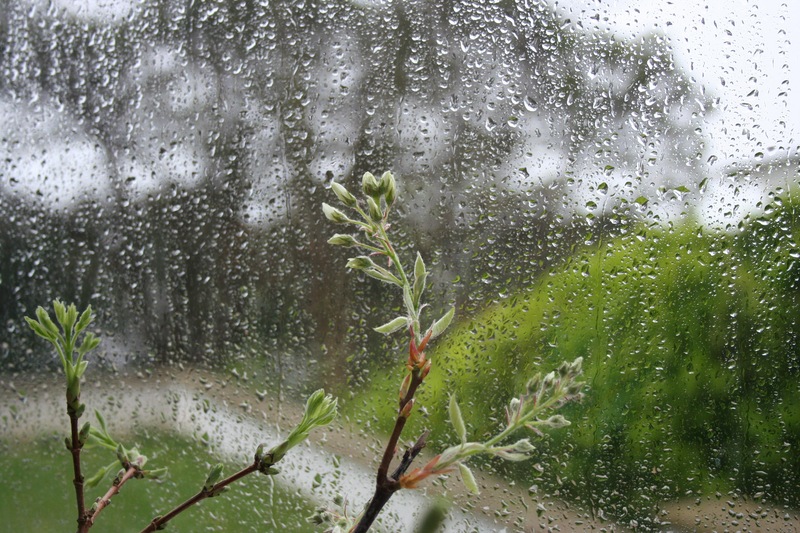 My amelanchier is nearly there too, but not quite. 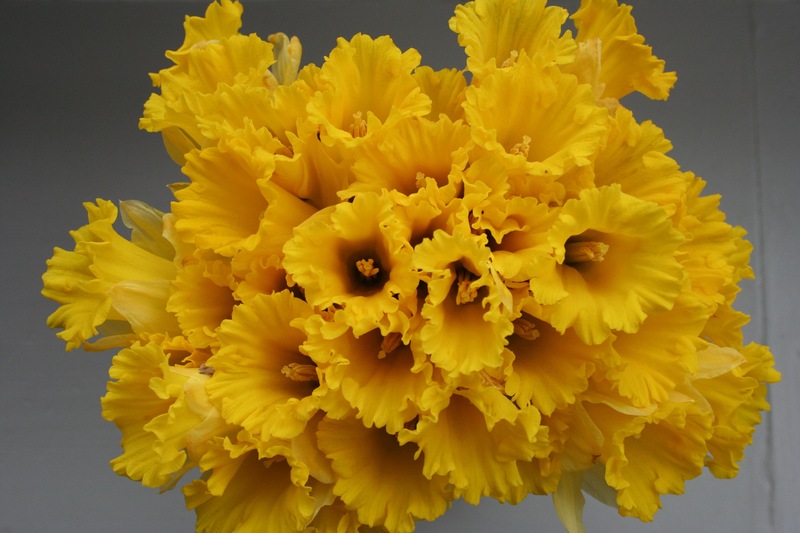 Supermarket daffs are too good to miss! Instant sunshine. Am really interested in your native hedge, and to hear how it gets on. I am planning one when we move up to Speyside at some point in the next 2 years. At the moment there’s a very high cotoneaster hedge which is going to come OUT. How tall do you plan on letting yours grow? We’ll see how it does but I reckon about 5-6ft. Much higher and it would cut off part of the sea view which we don’t want to do. Yes, a cotoneaster hedge isn’t ideal – very dense and not brilliant for wildlife.